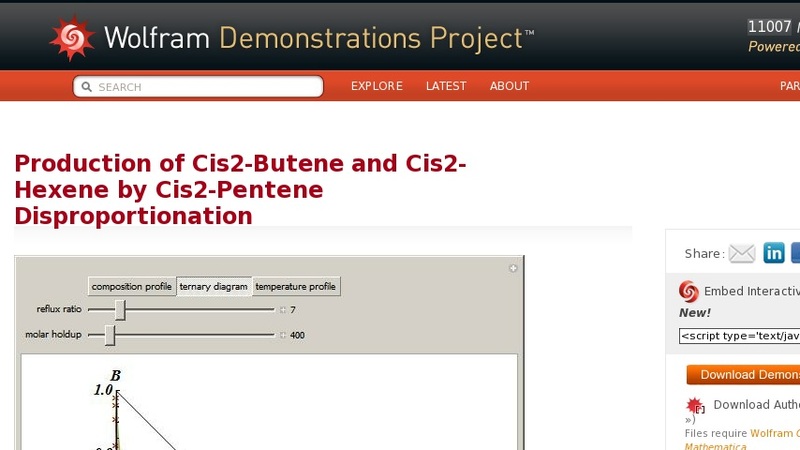 Consider an ideal ternary mixture composed of components cis2-butene ( ... ), cis2-hexene ( ... ), and cis2-pentene ( ... ). This mixture is subject to an equilibrium-limited chemical reaction ... (metathesis or disproportionation of olefins: 2 ... cis2-pentene ⇌ cis2-butene + cis2-hexene) with reaction rate ... , where the equilibrium constant ... and ... , with ... cal/(mol K). This mixture is fed to a reactive distillation column operating at a pressure of 3 atmospheres with 13 plates; the feed stage location is stage 5, the reactive stages go from stages 2 to 7, and the feed composition contains 100% mole ... or pure cis2-pentene. The feed flow rate is chosen to be 100 kmol/hr. For simplicity, we assume constant molal overflow (CMO) and neglect heat effects. This Demonstration shows three profiles: (1) the composition versus plate number for components ... , ... , and ... (in red, blue, and green, respectively) with the reactive zone shown in light blue and (2) a ternary diagram with the composition of ... versus the composition of ... in % mole, and (3) the temperature profile in the column. In the second profile, the feed composition is shown by a magenta dot and the reactive stages 2 to 7 are displayed in blue. The molar hold-up (in kmol) in the reactive plates is set by the user. The reboil ratio is chosen so that distillate and bottom flow rates are equal (i.e., ... , where ... is the reboil ratio and ... is the reflux ratio). For high hold-up values (i.e., high Damköhler numbers) one recovers the equilibrium case shown by the green curve in the ternary diagram.